Chantal Thomas: My name is Chantal Thomas. I'm from San Jose, CA and I'm twenty-nine years old. I'm a current senior at DeVry University, working on my B.S. in Computer Information Systems. 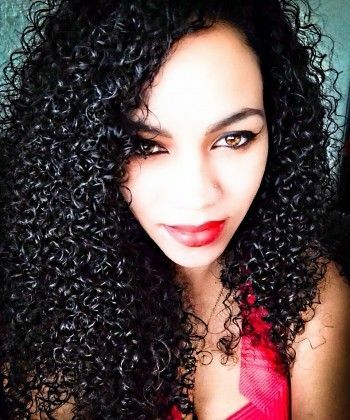 CT: I began embracing my curls my freshman year in high school. It was a struggle for me because I am biracial—my mother is black and my father is white. I didn't quite fit in and I was always teased about my hair. My freshman year in high school, I decided to step outside of my comfort zone, got rid of "the bun" and started wearing my hair down. Of course there were rude comments from a few, but most people were really nice. 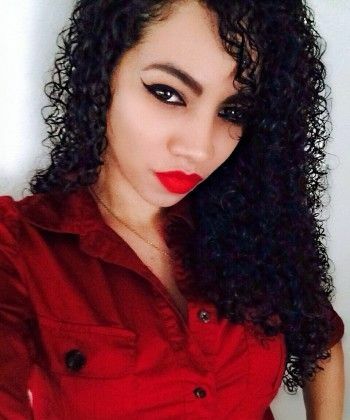 It surprised me that so many people were fascinated by my natural curls. NC: What's your current routine? CT: My hair gets dry really fast so to help retain moisture, I use Mixed Chicks Detangling Deep Conditioner twice a week. 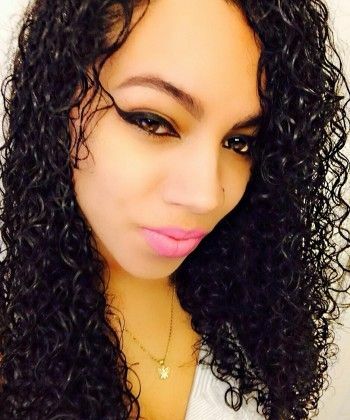 Daily, I use Mixed Chicks Leave-in Conditioner and then apply a generous amount of Josie Maran Pure Argan Oil. I've learned that oil is an important part of my moisturizing routine so I apply leave-In conditioner when my hair is damp, then use oil to seal the moisture in. I also try to avoid using my blow dryer at all costs…when it's absolutely necessary, I blow dry my hair using the cool setting. Otherwise, I'll let my hair air dry. NC: From start to finish, on a curly day, what's your process? CT: My process is pretty quick and simple. I'm constantly trying out new products so the products may change, but my process is always the same. First I co-wash and detangle while showering. Once I'm out of the shower, I pat my hair dry with a t-shirt. Next I section my hair into six even parts and I rake leave-in conditioner into my hair using my fingers, making sure to distribute the product evenly. Then I apply a small amount of pure argan oil from root to end, paying extra attention to my ends because that's usually the first part of my hair to dry out. Then I flip my hair upside down, shake it out and apply a little more argan oil. Finally, I flip my hair back and shake it out once more, separate my bangs a little then voila, I'm all done! CT: Even though I use it sparingly, I have to have a wide tooth comb. Sometimes my hair gets too tangled and I have no choice but to use my wide tooth comb. I also can't live without my large hair clip or pure argan oil. My hair clip keeps my curls out of my face while I sleep and argan oil has recently become an important product to me. It doesn't leave my hair greasy the way other natural oils have, in my experience. CT: At nighttime, I put my hair up using a large hair clip. My hair is pretty long so to keep my curls from hanging in my face, I have to twist it up before securing it with my hair clip. This way I can control how much I let hang outside of the clip. Sort of like the pineapple technique, but not quite. NC: If you've always been natural, did you ever have any curly girl insecurities? CT: I've always been natural and my insecurities as a curly girl began at a very young age. I remember being so tender headed that I would hide to avoid getting my hair combed. I assumed that it hurt because my hair was so curly, which caused me to hate my hair. I was also raised by my grandparents and my grandma would comb my hair into these old fashioned puffy ponytails all over my head. That made me hate my hair even more. It was pretty bad! CT: My favorite thing about being curly is that I don't have to spend too much time styling my hair. After moisturizing, it just kind of does it's own thing. Not to mention all of the nice compliments I get! It's a great feeling when people tell me my hair is beautiful and I know I only spent twenty minutes on it. 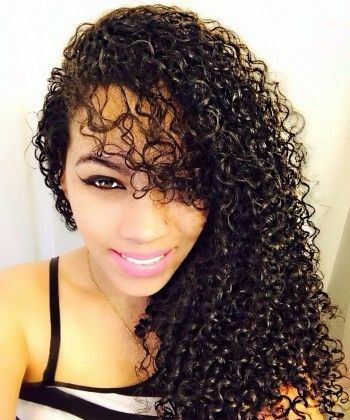 NC: How do you think having curly hair impacts your life? CT: Having curly hair has definitely been a blessing for me. I wake up and take a shower and before I get out, my hair is already halfway done. Don't get me wrong, It was very difficult and frustrating at first, but once I developed a routine my life became so much easier. CT: There is nothing more beautiful than loving yourself and everything about you, including your hair. Once you love yourself, no one else's opinion matters. And don't forget to be patient! It took me forever to find out what works for my hair. What works for me, may not work for you. You just have to try different things until you're satisfied. You can find Chantal on Twitter or on Instagram.